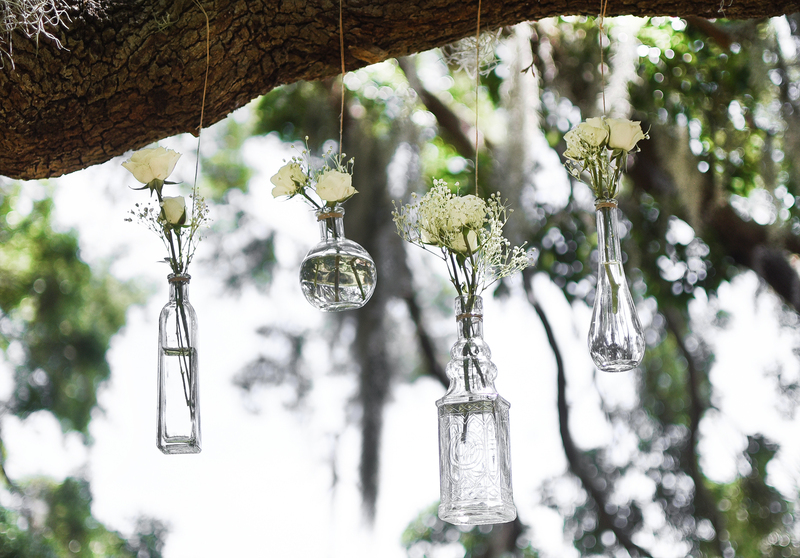 How dreamy are these DIY Hanging Flower Vases?! 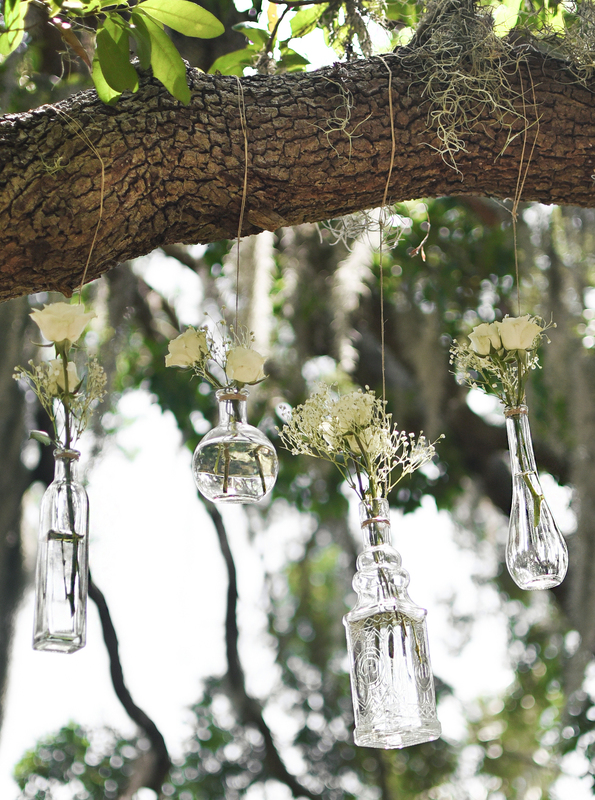 They’re gorgeous for a backyard wedding, adding a “fairytale” vibe to your space. 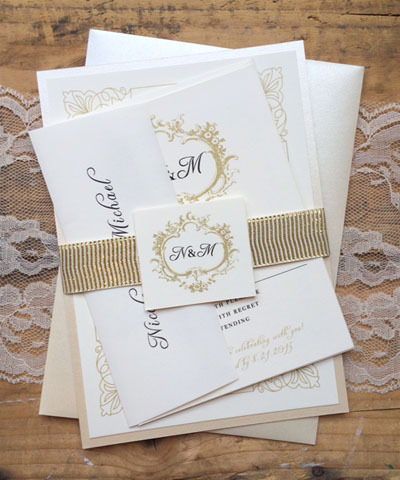 Simple enough for all #DIY brides to make, we’ll show you the steps below to replicating this look yourself. Don’t fret- no green thumbs are needed! Gather materials. 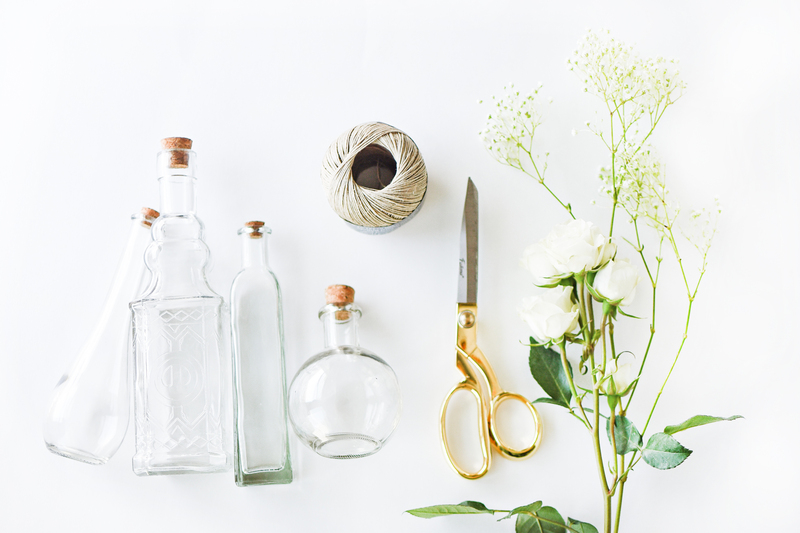 You’ll need a variety of small glass vases (Michaels and Hobby Lobby have great selections), natural hemp or jute cord, scissors, and your choice of flower stems. 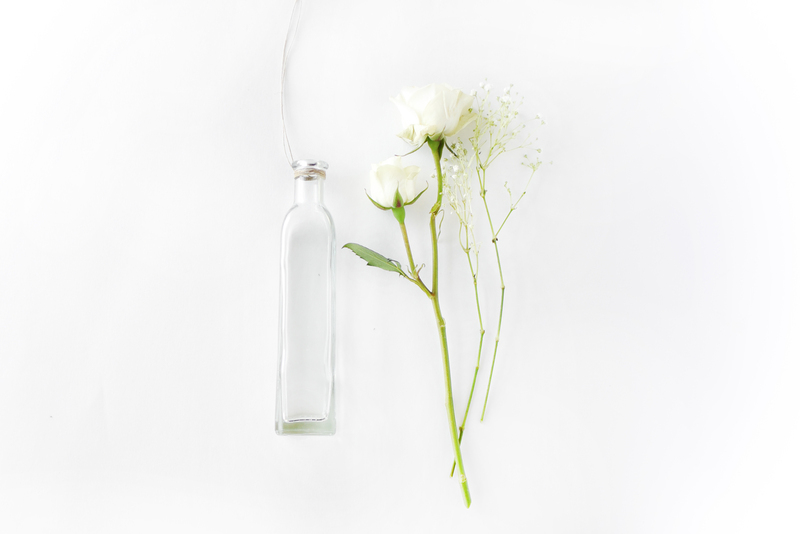 Make sure the vases you choose have rims at the top, so that cord can be wrapped under this edge, and be secured for hanging. 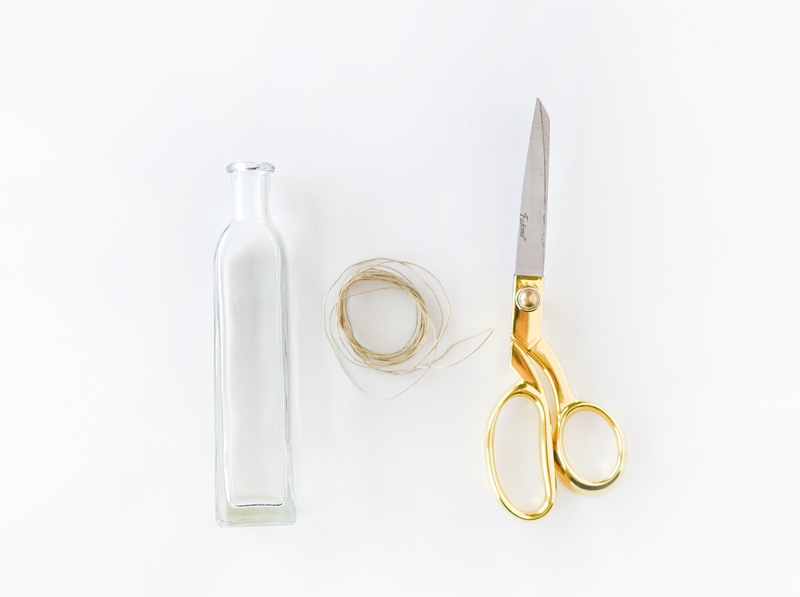 Cut a long piece of hemp (ours was about 7′ long) for wrapping around your vase. Find the very middle of the hemp, and wrap tightly about 5 times under the rim of the vase. Tie the hemp in a tight knot to secure the wraps. 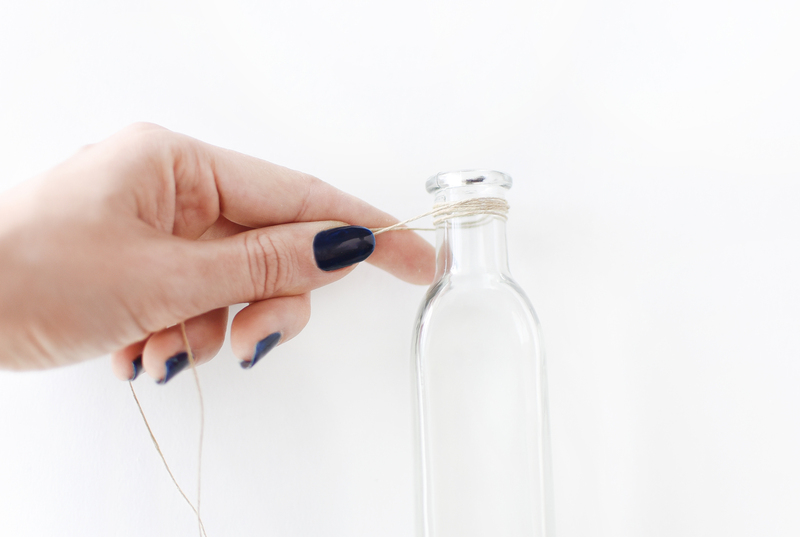 Repeat with your other chosen bottles – leave the hemp hanging long so that you can use this to hang the vases with! 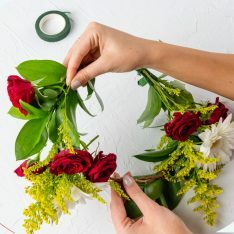 Cut your chosen foliage into small sprigs, to fit in each vase. 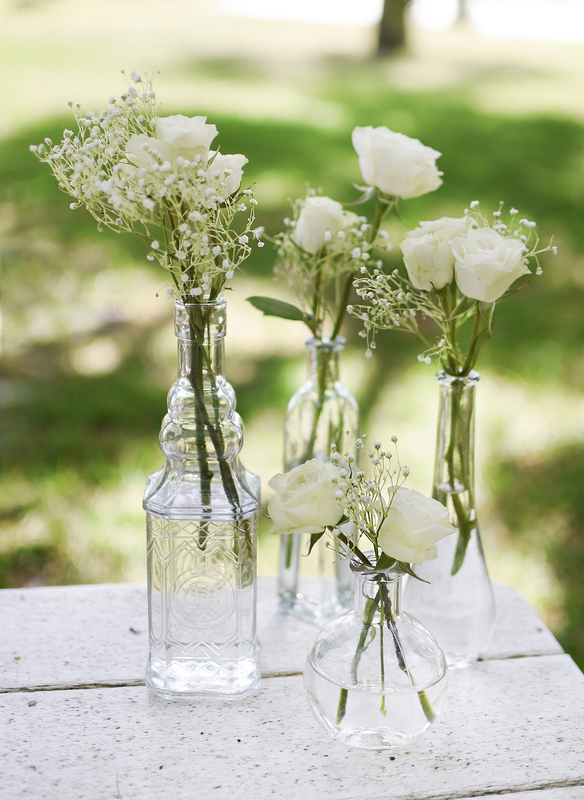 Next, fill the vases with water, then insert your flowers. 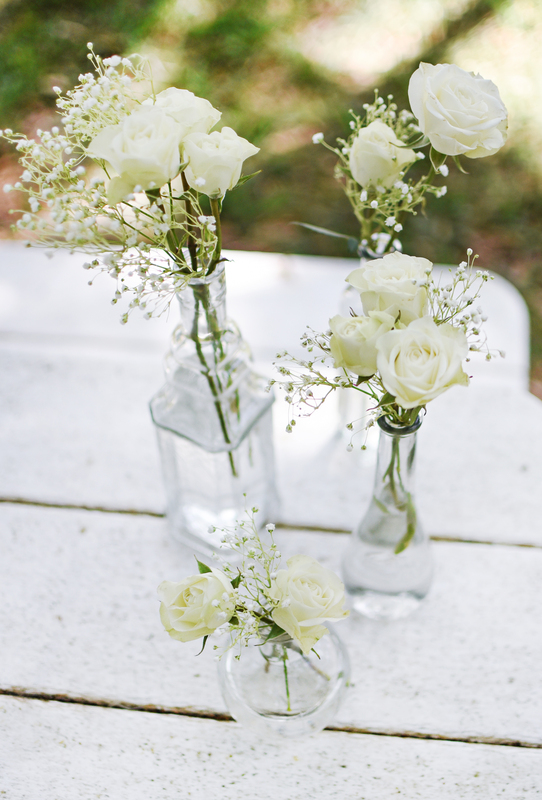 We love the mix of mini roses and baby’s breath, in a neutral color scheme. 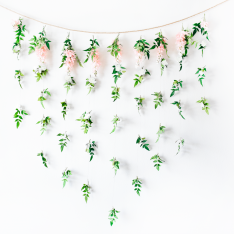 In your outdoor setting, find a low-hanging tree branch and tie the loose ends of the hemp around the branch, securing it with a couple knots. 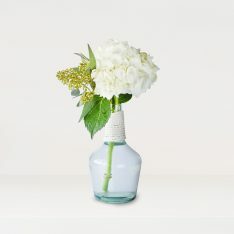 The key here is to use small vases – a large vase will be very heavy. 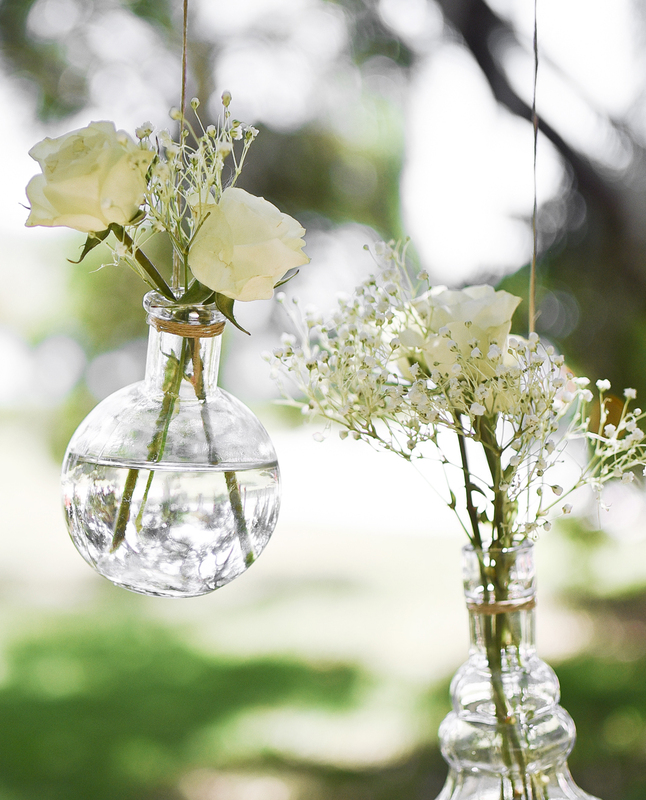 To save weight, you don’t have to fully fill the vases with water – just enough to meet the ends of the foliage! 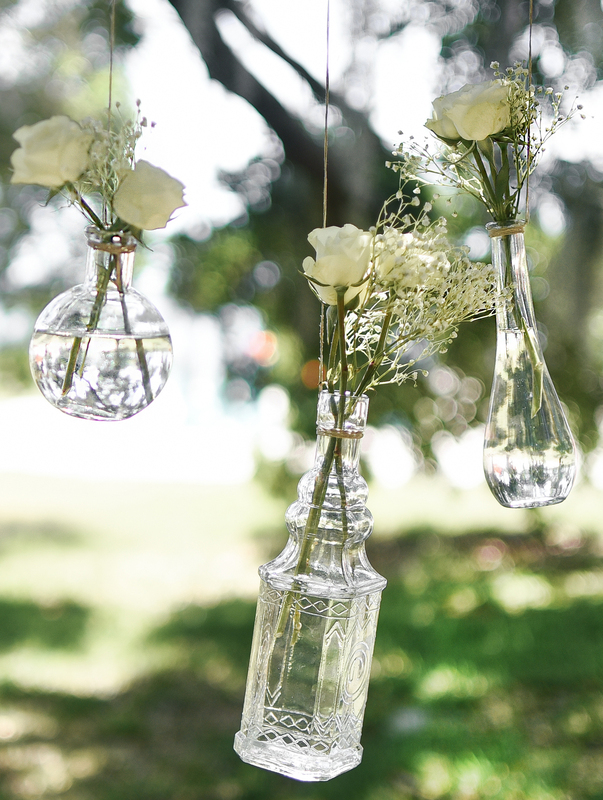 These vases will look like they are floating! 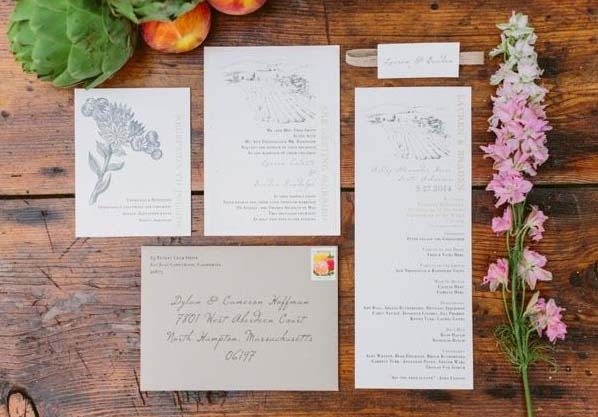 Simple blooms like these don’t take away from the natural greenery backdrop – if you’re looking for a color pop, use wildflowers in all different hues for less subtlety. 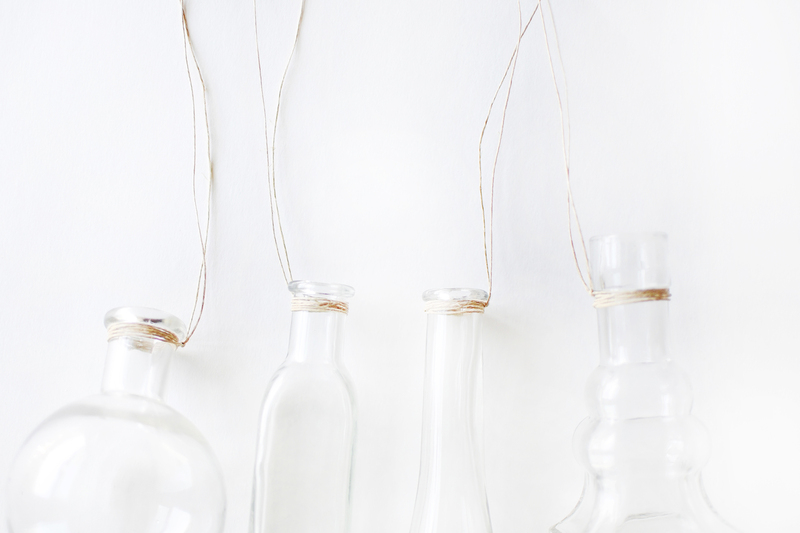 If you aren’t looking to hang these, they’re equally as cute when paired together as part of a tablescape. 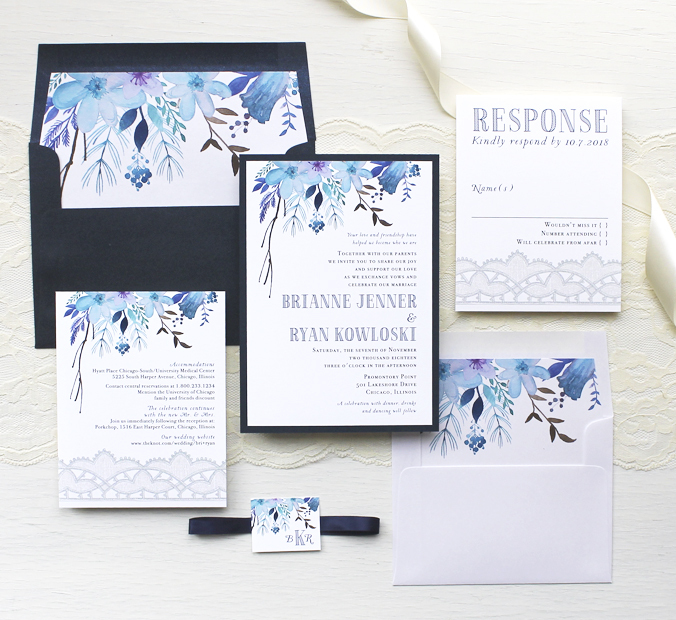 The mismatched look of the vases adds an eclectic-chic touch! 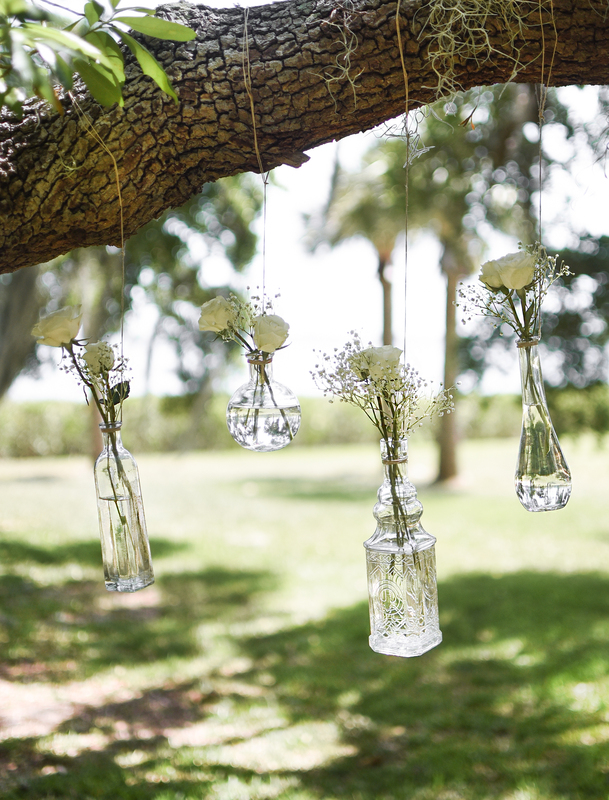 What flowers and blooms will you use in your DIY Hanging Flower Vases? Let us know!